Small Planet Tofu is an independently owned artisan tofu company that buys organic soybeans directly from organic family farmers in the Midwest. 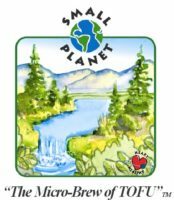 Small Planet Tofu has stable, long-term relationships with these farmers. They write: “Simply The Best Tasting Tofu On The Planet.” Small Planet Organic Tofu produces some of the finest and most innovative organic tofu, in a true artisan tradition. Started in 1992 by TOFU Phil and now part of Penrith Farms, we handcraft and create not only organic, but preserving an honored tradition as one of the original artisan foods with a great flavor and texture. Our main ingredient is certified, organically grown soybeans, grown and purchased directly from American farmers. Using all organic ingredients shows our commitment to being Green and producing a “No-Games Organic” product. We use traditional Japanese methods with a little modern ingenuity, bringing to you our flavor-infused organic tofu. Our products include, Fresh & Savory Baked, Original Firm Tofu, along with Garlic & Herb, Spicy, Curry, and our newest flavor, Sun-Dried Tomato, all infused with flavor and all organic. All of our products are wheat & gluten-free, making them Celiac-friendly, and totally Vegan.